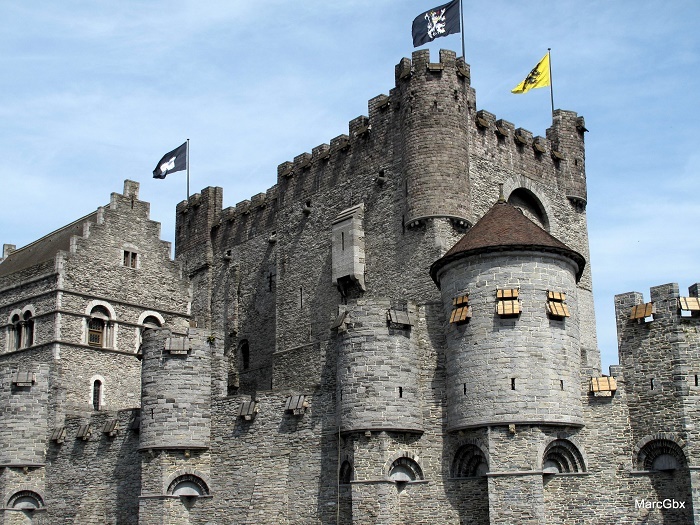 Gravensteen is a castle of great importance, originating from the Middle Ages, located in the city of Ghent, within the Flemish Region of the Kingdom of Belgium. 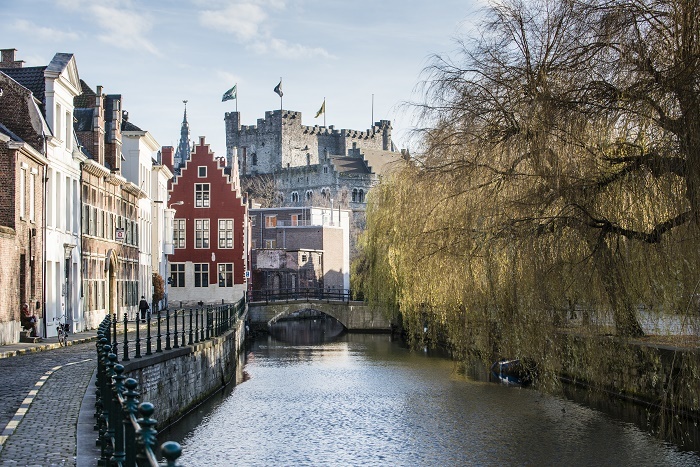 The first person to ever fortify this place was the Count of Flanders, Arnulf, who built a medieval bastion on this high sand dune consisted of a central wooden building and several surrounding buildings, also in wood, naturally protected by the River Leie and its marshy banks. At the beginning of 11th century, the central wooden building was replaced by a stone residence, consisting of three large halls that made up three floors, connected by a stone stairwell. 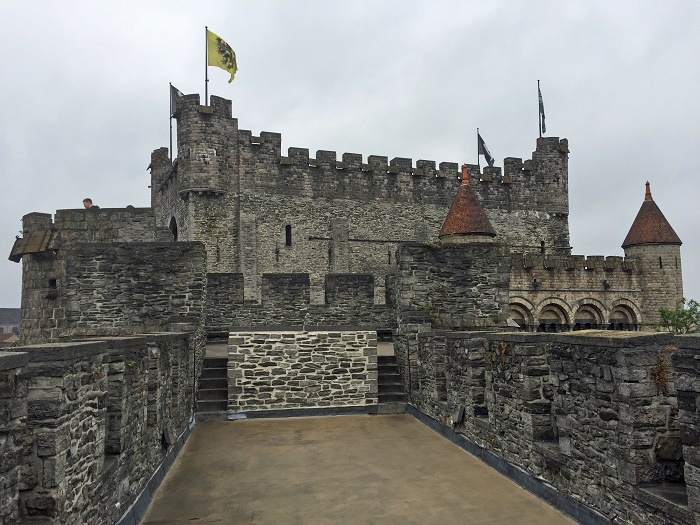 Throughout the years, the castle changed its features, especially its look, however, the drastic change came in 12th century, when the Count Thierry of Alsace wanted to demonstrate the prestige of the Count of Flanders to the monarch and other noblemen, citizens or subordinates. 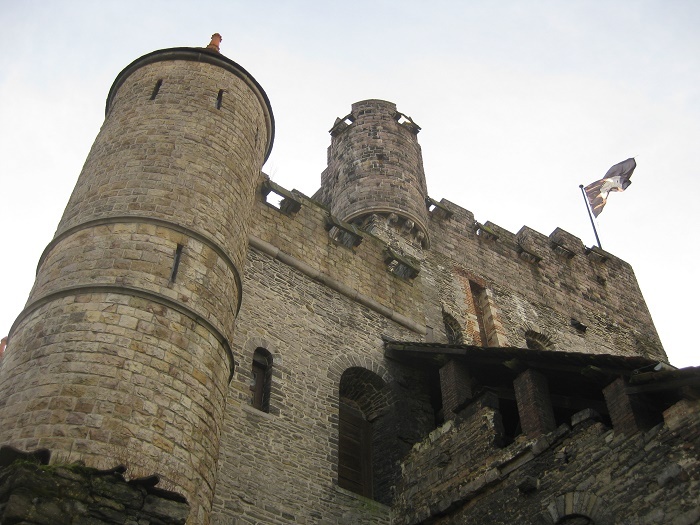 The castle that we see today is the work of the Count Thierry’s son, Count Phillip of Alsace, who built it in 1180, and was modeled after the crusaders castles that Philip of Alsace encountered while he participated in the second crusade. There is an inscription in Latin above the entrance gate that states that Count Phillip built this castle, where the motte hill was made higher and wider. 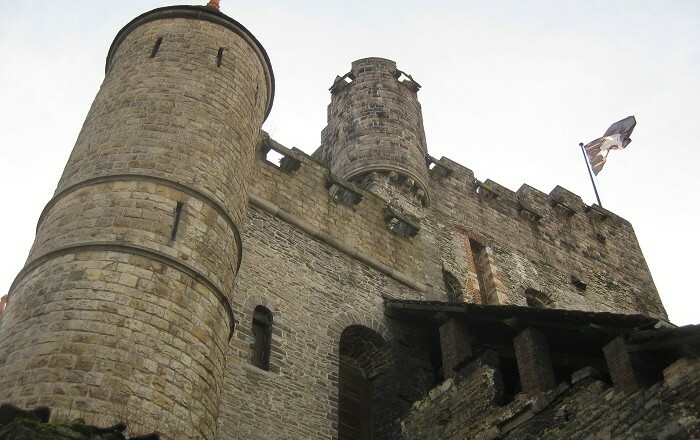 Since the rich aristocrats in Ghent had started to expand their influence in the area, commanding privileges and translating their prestige into impressive stone houses, Philip had to show his authority by making his own stone castle, thus creating the central building which became a mighty donjon, standing at about 30 meters (100 feet) tall. In addition, there are two basement floors and two large floors above ground, the lower of which was fitted out with a brick barrel-vaulted ceiling, however the upper hall was purely residential. 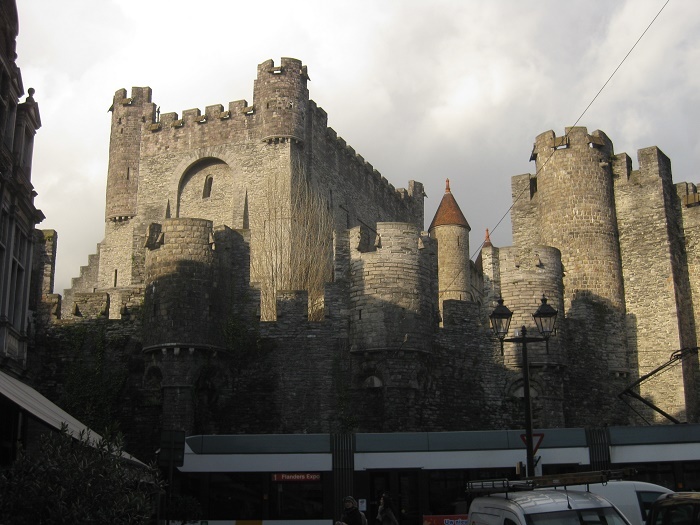 Gravensteen Castle served as a seat for the Counts of Flanders until 14th century, when they abandoned by the many counts, which made it a great possibility to be used as a courthouse, and prison, gradually loosing its importance over the course of 18th century. Several of the buildings were sold, and the engineer Jean-Baptiste Brismaille bought the former motte castle and converted it into an industrial complex, which at the time housed cotton mills, a metal construction workshop and some fifty working-class families. Even though the premises were under private ownership, there was not much of a care given to the castle, and by the second half of 19th century it was planned to be demolished and sold as a building lot. 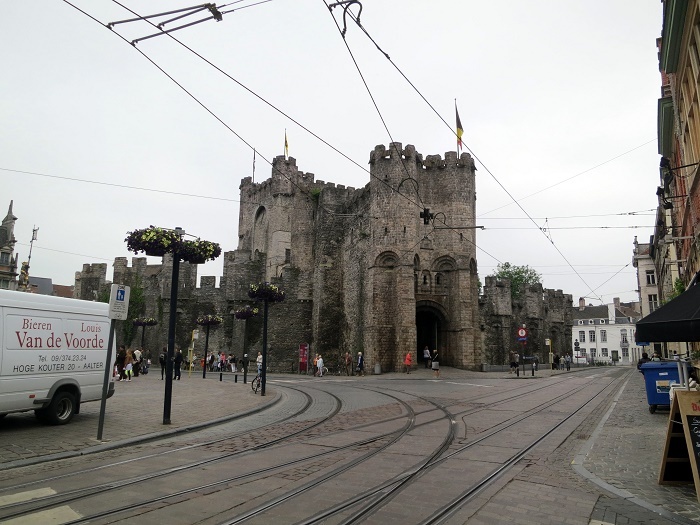 Fortunately, there were no interested parties, so the castle was spared of demolition, thus giving the opportunity to the citizens of Ghent, who saw it as a symbol of power abuse, feudal oppression, gruesome torturing techniques and inquisition. 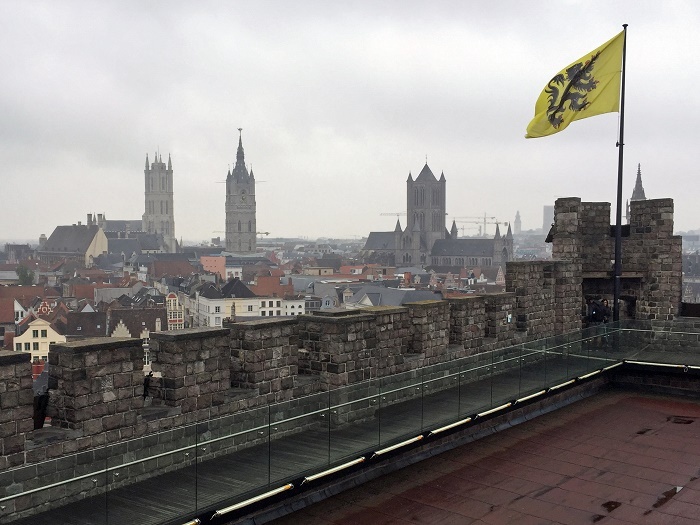 Starting in 1865 the City of Ghent, together with the Belgian State, began systematically buying back the buildings on the former motte from private individuals, an initiative prompted by a small group of Ghent’s citizens. By 1888 everything was in order for the reconstruction to begin, and practically everything that was not made from Tournai limestone was demolished. Officially in 1893, restoration work began, following the example of French restorer Eugène Viollet-le-Duc, and the architect in charge was Jozef De Waele, opted for a romantic interpretation of the castle back in the time of Count Philip of Alsace. 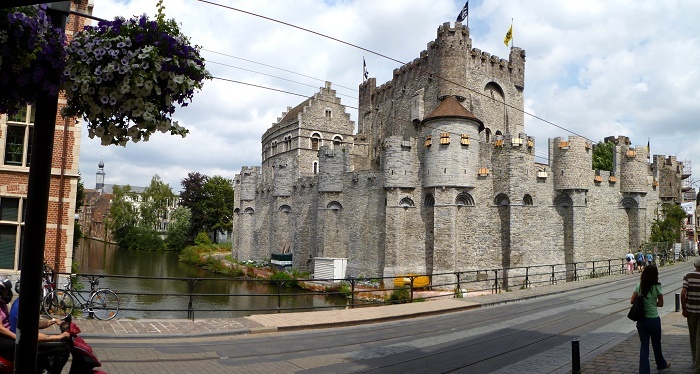 The reconstruction ended in 1907, where in 1913 the restored parts of the castle were shown on the World Fair in Ghent, and since then numerous cultural activities, events and parties have been held on Gravensteen’s premises. 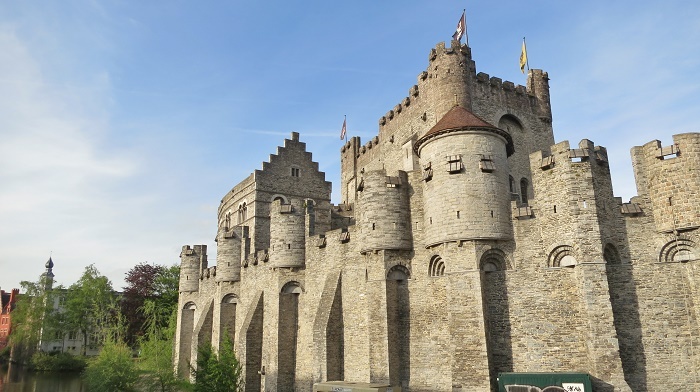 Nowadays, being one of the most important landmarks of Ghent, the visitors are even able to travel through the castle, witness the plenty of torture devices exhibited inside the castle and even get to the top, where they will see the amazing surrounding.